Guy Martin returned to bikesport at the weekend when he travelled to New Zealand’s South Island to race his monster Martek turbocharged Suzuki GSX-R1100in the 11th annual Burt Munro Challenge, a multi-event rally that attracts riders and racers from all over the country. Fresh from the tarmac, Guy was then in action on the beach. 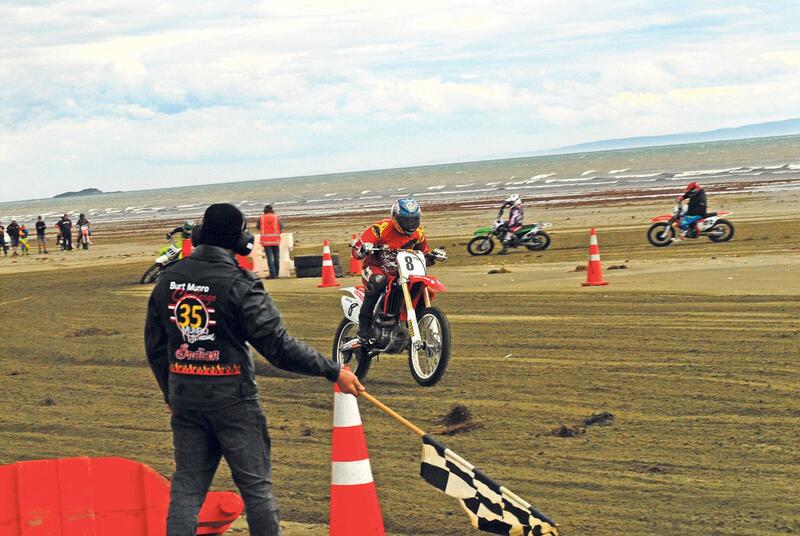 New Zealand’s oldest motorcycling trophy is settled here, where landspeed record hero Burt Munro learned his riding craft, and the windswept coast sees action once every year as part of this week of motorcycling. Thrown in at the deep end on a 450cc Honda motocrosser, Martin stood out in the pack with his leathers and road helmet as the riders flew down the sand as fast as the protesting singles would allow. He also impressed the off-road specialists by entering as many races as he could, and finishing mid-pack in most of them. In the speedway leg of the Challenge, Martin rode a Yamaha R1-powered bike before fitting wets to his Martek Suzuki for the wind and rain-lashed street racing, which was cut short when fencing blew down and on to the track. With the Burt Munro Challenge bending the rules to accommodate his 1380cc turbo, a return visit for Guy next year looks on the cards when the TV star would hope to imporve on his tenth place this time out. “It’s a great event,” said Guy. “And it’s great that I get to do so many different things. It’s more about the event, the machines and the people. The racing is great but there’s more to it than that. What is the Burt Munro Challenge? Find out what happens when you dare Guy.